Our online Box Office is managed using Ticketsolve, and payments are processed through Realex. All orders – including those made by telephone or in person – will be processed through these systems. You have the right to opt out of any communications, or to ask that your details be removed from any or all of our databases, at any time – please click the link in any email, call us, or email boxoffice@torchtheatre.co.uk to update your preferences. We will never sell any part of your data, nor will we pass it on to any third party, artist or promoter, without consent. We may, very occasionally, contact you ourselves to let you know about events by other promoters which we think you might enjoy. Information about your computer and about your visits to and use of this website, such as your IP address, geographical location, browser type, referral source, length of visit and number of page views. Please note that this information does not identify any individual user. Details of any transactions you have made when booking tickets. We may use your data or permit other selected organisations (our service providers and agents) to use your data, to provide you with information about services which you have requested. Cookies used on this site can be categorized into three levels: strictly necessary; first party functionality; third party functionality. Torch Theatre’s online ticketing system Ticketsolve, use temporary session cookies enabling customers to pass through the correct payment pathway. These cookies therefore enable services customers to have what they have specifically asked for, that is, they enable customers to book and purchase tickets for an event. These are cookies that we have direct control over that allow the sites to operate. A cookie is used for parts of the site to operate and allows the administrators of the site to manage the content appropriately. This cookie is not used for any other purpose, and it is a session cookie meaning that it will not be stored after the user closes their browser window. These are cookies that we do not have direct control over that allow the sites to operate. We use third parties to either provide additional functionality on the websites (such as Facebook Like buttons) or to track users anonymously and report back to funders the information needed to allow us to continue to provide the website and events programme. Some of these services will set cookies in the process but may use these cookies for their own purposes. Our Facebook Connect plugin activates if the user is already logged into Facebook, and it sets cookies to identify the user's Facebook session and interaction with our website. The transmission of information over the internet is not completely secure. We will do our best to protect your personal data, but we cannot guarantee the security of the data transmitted to this site and any transmission is at your own risk. 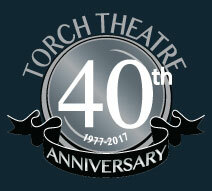 Please be aware that Torch Theatre may be obliged to give information to the relevant authorities if required to by law, in which case we will comply with judicial proceedings. If at any time you wish to unsubscribe from our emails, or to change and update your personal information, please contact us directly or use the links at the bottom of the email to unsubscribe.